By Sister Malini Manjaly for Matters India / View more photos. 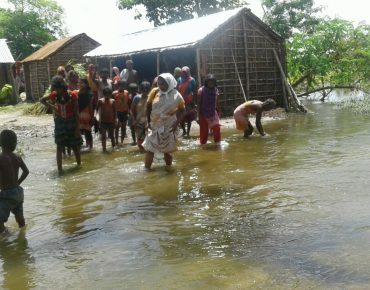 Goalpara: The Sisters of Charity of Nazareth have come to the aid of people in ten villages reeling under the flood fury in Bihar’s Madhepura district. Goalpara block is around 290 km north of the state capital of Patna. Two women were killed on Aug. 21 as they waded through water flowing over a small bridge in Fulaut village in Madhepura district. Bihar flood death toll continues to rise. As on August 21, the state reported 253 deaths in 20 districts. The water level in the catchment areas continues to rise in incessant rains. 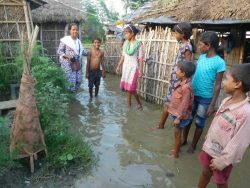 “Although water seems to recede gradually, many houses are underwater,” Sister Lilly Thomas, a trained nurse, told Matters India on August 20. The worst affected districts are Araria, Sitamarhi, Kishanganj, Madhubani, East and West Champaran, Purnia, Katihar and Khagaria. Hundreds of thousands of people have been evacuated and many are left homeless and shelterless. The Nazareth nun said local people are afraid that they would face a repeat of the 2008 tragedy when the entire area was submerged under water for days. Pappu Kumar of Babangamma, a flood-hit village, echoed her fears when he said most of their standing paddy crop has come under water. The Nazareth nuns, who are locally known as Navjyoti (new light) Sisters, manage a school, a hostel with 130 girls, and a dispensary to serve the poor in Shapur, which 25 km south of Madhepura district headquarters. As roads are washed out at many places, the administration has discontinued bus connectivity from Patna to Kishanganj through Madhepura and Goalpara for more than a week, said Charlish Hembrom, a resident of Shapur. The condition of many bridges over the swollen rivers is not safe for buses and heavy vehicles to ply on, he added. The government machinery provided food in 12 flood relief camps at various places. Each camp accommodated around 1,500 people. “There are absolutely no sanitary facilities for the people,” laments Punam Soren of Shapur Santhali tola who lives in a relief camp. Women and young girls have no toilet facilities. 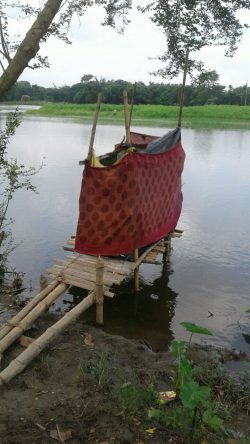 “People have erected bamboo platforms over the water body, covered in cloth, for toilets,” Sister Thomas explained. The area also faced acute shortage of drinking water. Most tube wells are submerged, said Naresh Kumar from Bhudela village. The block has set up one dispensary with a doctor and a few health personnel for any emergency in the area, the nun added. The government has distributed a food kit with 5-kilogram rice, pulses, oil and other supplies for every flood affected family. Sister Thomas lamented that many more families remained cut off due to washed away bridges and roads. She further said many people are marooned in their villages with whatever food and water they could have saved from the floodwaters. As the news of approaching flood waters spread, the Nazareth Sisters gathered drinking water and food for themselves, teachers, 35 hostel children whose parents could not take their children back home before the floods submerged their villages. The floods have made the mobile connectivity sporadic, said Sister Prabha Kujur, the hostel warden. Wading through knee deep or more waters, the nuns continue to visit people to assess their immediate needs. One of their priorities is to mobilize funds to begin the relief work as the flood water recedes. Sister Thomas said people have not fallen sick yet. She is afraid that water-borne diseases would break out as the water recedes there. “We are prepared with medicines to meet any eventuality,” she said. 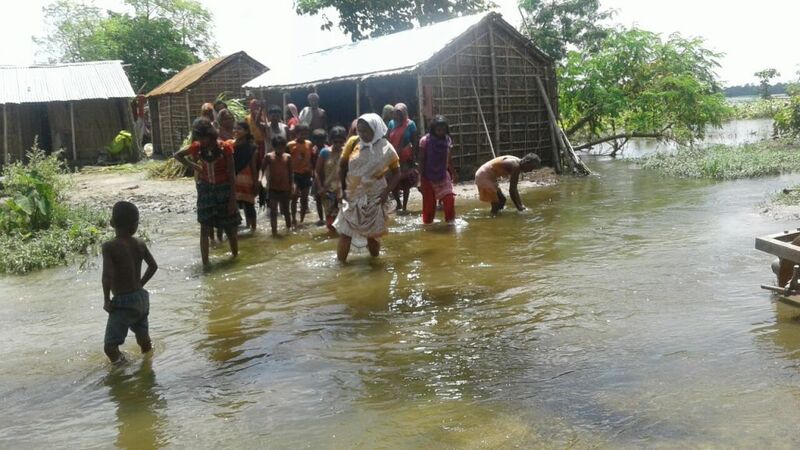 After the water recedes, the nuns plan to conduct health camps in villages. More than 3,000 families are in need of housing for their thatched huts made of bamboo and mud are completely collapsed, Sister Thomas said. Nazareth Sisters manage an outreach program in the ten villages. They also conduct non-formal literacy classes for women and for children who do not attend regular schools. Around 500 women in various villages have made 40 self-help groups for saving and inter-loaning among themselves. They have a saving of 532,485 rupees. For income generation, women and teenage girls attend training programs in tailoring, mushroom cultivation, vermin compost, phenyl and detergents at Navjyoti. Around 30 women have set up shops in villages to sell these items. Around 25 women have regular income from sewing and cutting. They make a living working from their own houses. For awareness building, many leadership training programs are conducted for women and youth. 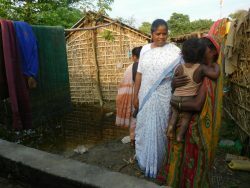 Around 22 families received toilets made from government schemes and 120 families received Indira Avaas. Around 93 families living below poverty line got the cooking gas connection. Where to send a donation? Our thoughts and prayers are with you. We pray that each of you stays well so you can be available to those most in need. Blessings and hope. Thank you for the update, Malini. You have made the flooding more real as we hear stories of the people who have been affected. I pray for the people and the sisters involved.